A stay at Elide Hotel places you in the heart of Rome, walking distance from Piazza della Repubblica and Santa Maria della Vittoria. 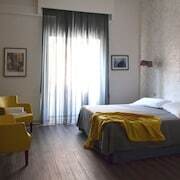 This hotel is within close proximity of Teatro dell'Opera di Roma and Palazzo Barberini. Make yourself at home in one of the 14 air-conditioned guestrooms. Your Select Comfort bed comes with Frette Italian sheets. Complimentary wireless Internet access is available to keep you connected. Conveniences include desks, housekeeping is provided once per stay, and irons/ironing boards can be requested. Grab a bite from a snack bar/deli serving guests of Elide Hotel.